I had seen it coming in ads previously, and so I was excited to get my hands on the FAMOUS 1ST EDITIONS Treasury Edition reprint of FLASH COMICS #1, the first appearance of my favorite super hero. This would be the last in this series, unfortunately (it would come back for a final gasp around the time of SUPERMAN THE MOVIE for a reprint of SUPERMAN #1, but that was still three years in the future.) I was a sucker for comic book history even then, so I loved these oversized reprints of key comic books. 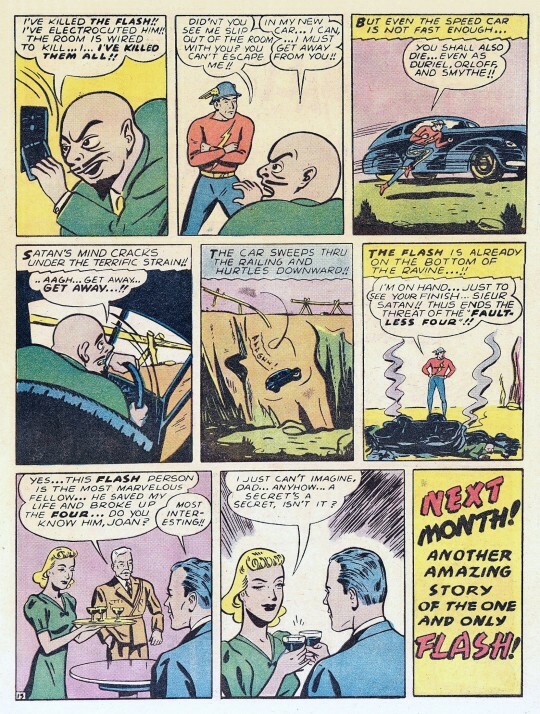 It must be said that FLASH COMICS #1 is a pretty crude comic book. Almost all of the art in it is pretty weak, and in fact a few issues later, almost all of the important strips would change artists, trading up to better technicians. But none of this really bothered me when sitting down to read it for the first time. My tastes weren’t yet so sophisticated that I couldn’t draw enjoyment from even the simplest Golden Age comic book story. In fact, I found many of them to be fascinating. 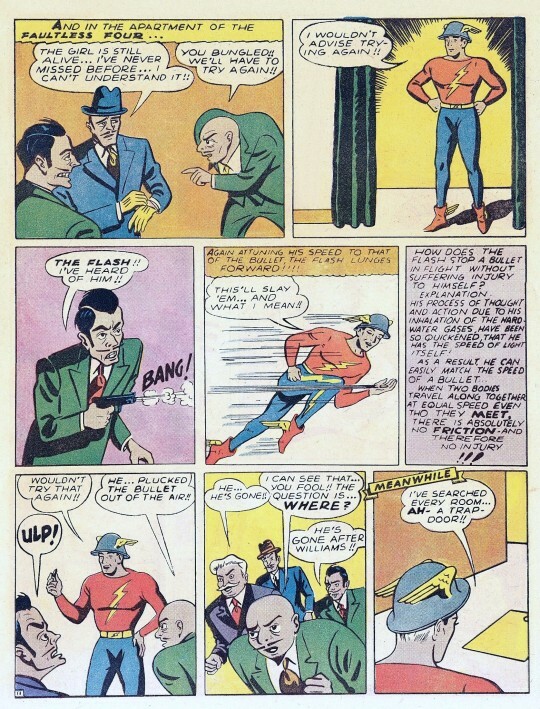 The Flash was one of the first “specialist” super heroes. Rather than being good at everything, as Superman and Batman were in their way, the specialists all had a single trait which provided their particular skills–be it stretching, bursting into flames, breathing underwater or running at phenomenal speed. 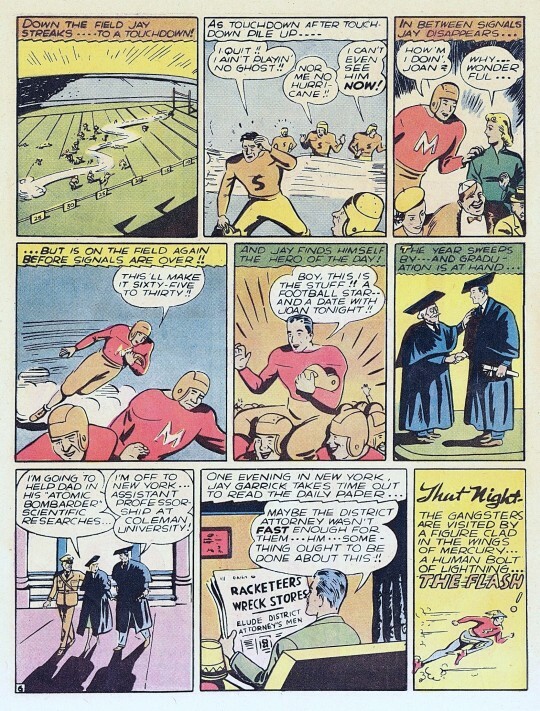 This first Flash story is pretty interesting, as the first half of it plays like a box office college comedy, as “Leadfoot” Jay Garrick becomes superhumanly swift and cleans up on the football field. He has no motivation for becoming the Flash other than just a desire to do good and help the community–and his first in-costume appearance is a tiny panel on a nine-panel page, which is certainly anti-climactic. It’s also interesting that, in these early days, the super hero formula hadn’t quite all been worked out. So it was that in subsequent issues both the Flash and Hawkman’s true identities were no secret–everybody knew them. And then, suddenly, like a lightbulb going off, writer Gardner Fox or his editors got it, and their identities were secret again, without the slightest explanation. 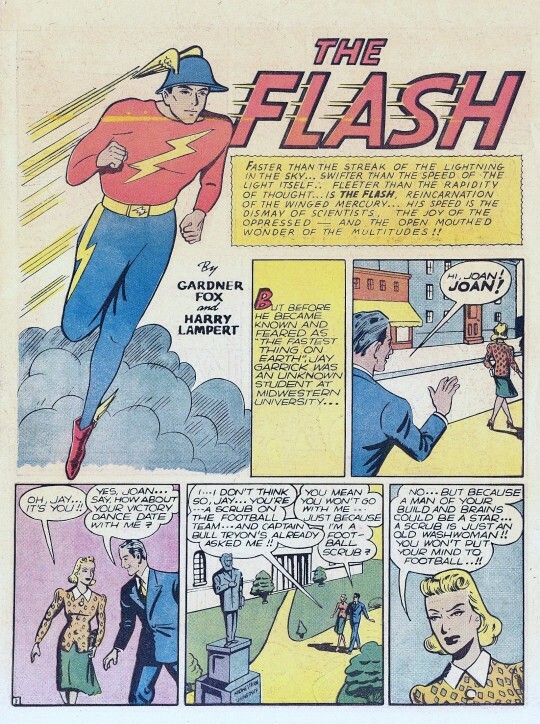 There are a couple of other noteworthy features in this first issue of FLASH COMICS. but Cliff Cornwall wasn’t one of them. 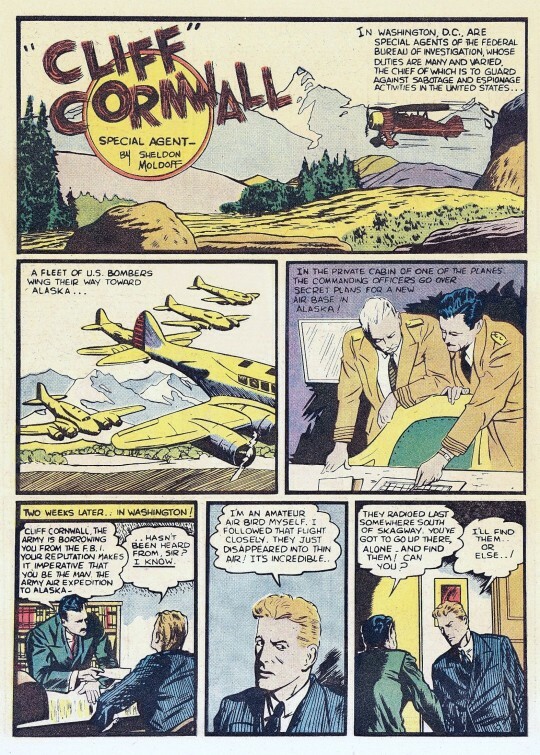 It was a run-of-the-mill adventurer strip, of the sort that every anthology comic book was fielding. 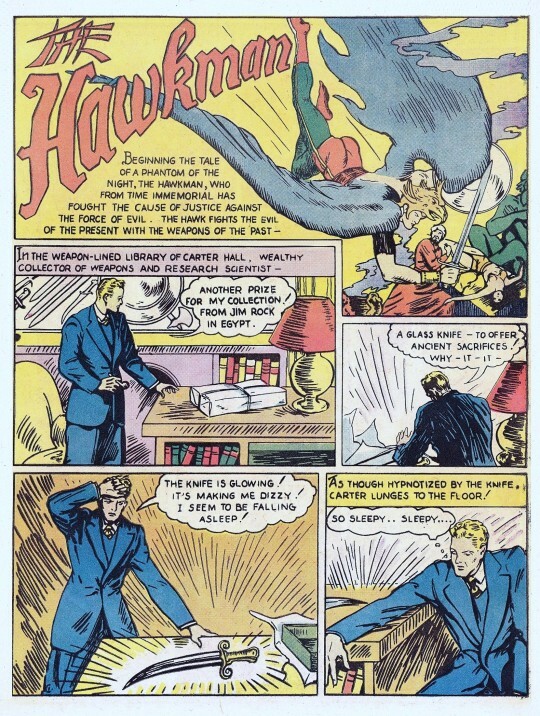 The art was among the most realistic in the magazine, but was also stiff and unconvincing in its attempts to channel (or swipe) Alex Raymond. Next was Johnny Thunderbolt A.K.A. 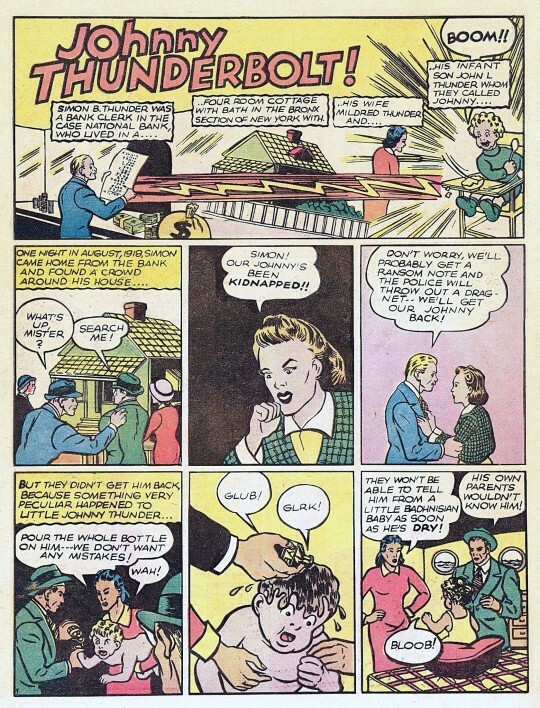 Johnny Thunder. 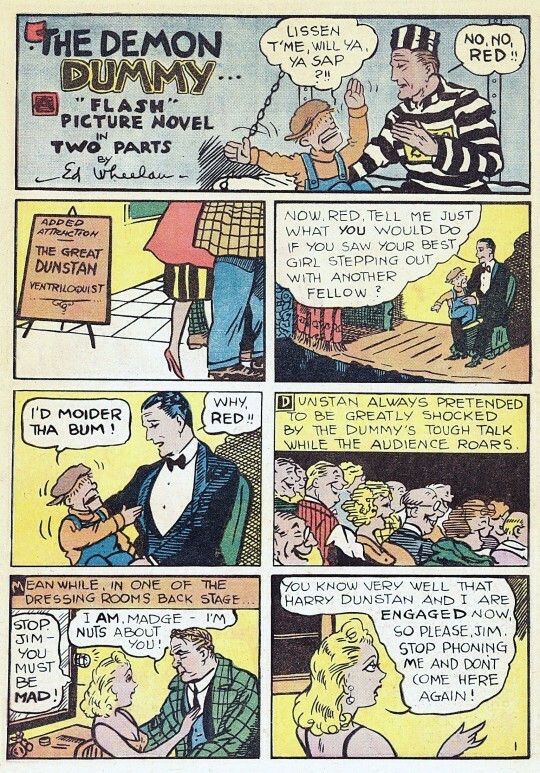 This was a comedy-adventure strip, taking some of its cues from the films of this era. Based on this first installment, it would have been impossible to predict that Johnny would last for so long, and be such an integral part of DC Comics history. Ed Wheelan, the cartoonist who had done the “Minute Movies” newspaper strip for a number of years, contributed the next strip, very much in line with his earlier efforts. This one was straight out of the B-pictures, with a ventriloquist dummy tormenting its operator. The story ended in a cliffhanger, and it would take me literally decades before I was able to find out how it all worked out. 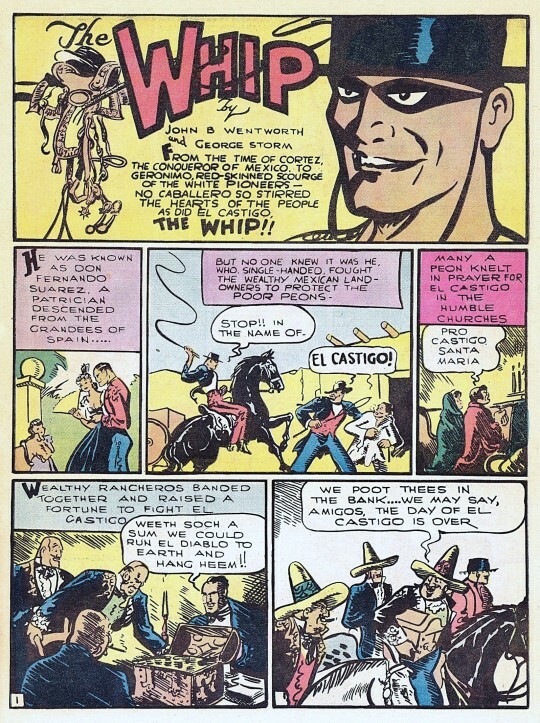 The final story in the issue was The Whip, a blatant Zorro knock-off whose one innovation was in setting the series in contemporary times. Polo sportsman Rod Gaynor took up the identity of the legendary El Castigo to mete out justice in a California not too removed from the one in western movies. It was fun, but by-the-numbers fun.